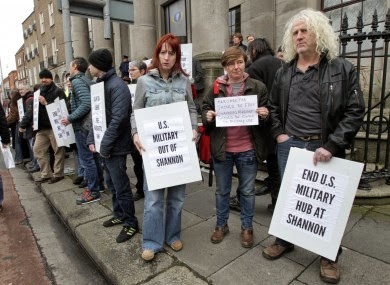 I just got home from having lunch and gossip with the notorious Sarah Clancy, pictured here centre, to learn that the two people pictured either side of her - TDs Clare Daly & Mick Wallace - were this afternoon arrested at Shannon Airport for attempting to inspect what they believed to be two U.S. military aircraft. It has long been alleged that military equipment and 'rendition' prisoners on their way to very bad places are regularly transported through Shannon. I have a, well, complicated relationship with the anti-war movement. I just find it a bit hypocritical of some to loudly oppose torture and illegal invasions by the U.S. when you were enthusiastically for the Soviet invasion of Afghanistan, or indeed anywhere else the Soviets chose to invade, and are sorry the Stasi are no longer there to torture those you think need torturing. It may be a minority, but a significant part of the anti-war movement is soft on tyrants, and by soft on tyrants I mostly mean soft on themselves. In the hearts of some 'peace activisits' there certainly lurk future Ceausescus. Then again, I would say that wouldn't I, because, as Cillian Gillespie of the Socialist Party used to like to say before the Party told him to shut up, I am a raving pro-war imperialist and, even, "an apologist for mass murderers". By "mass murderers" I think he meant Paul Wolfowitz. Poor Cillian. It can't be easy for him. Unlike too many others Clare Daly and Mick Wallace have no record of such secret worship of the interrogation methods of the East German secret police; or of endlessly downplaying facts inconvenient to their own side, such as the continued existence of George Galloway and Tommy Sheridan. Quite the reverse. Both have made enemies of those gurus on the Irish left who would, given the half chance, crown themselves Emperor. Whatever else can be said about Clare Daly and Mick Wallace, and some of the online commentary this afternoon has been predictably toxic, they probably have more courage between them than the entire rest of the Dáil put together. Reading much of the online commentary against them, I suspect that many of those venting are impotent males who these days can only achieve release by endlessly mowing the lawn. Finally, as well as having had lunch with the notorious Sarah Clancy this afternoon, I should declare a further interest, Clare Daly launched my book of essays, Mentioning the War, in Dublin in 2012, while the other, Mick Wallace, launched my recent poetry collection at the Cuirt Festival in April. Labels: Clare Daly, Mick Wallace, Shannon Airport.